A web site about "Unity"
5 pages, create an original site showcasing aspects of unity -- whether it's the whole planet, your neighborhood, your school or your favorite teams, real or imagined. 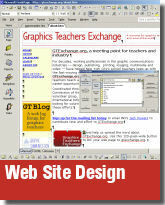 Sites may be created using Dreamweaver or HTML coding. Root folders with relative links should be uploaded to the FTP site and include HTML, JPEG, PNG, GIF and Flash files only. Maximum submission size is 10 MB. Interactivity, usability, layout and design, spelling and grammar. See the rubric at right. Ideas are expressed in a clear and organized fashion. It was easy to figure out what the site was about.